This Hayden Island Virtual Tour is based on the map and guide from OregonHikers.org. The (below) Google bike tour of Hayden Island is another version of the Island Tour. It doesn’t have the 360 degree photos. The biking tour (above) explores Hayden Island on both sides of the I-5 Bridge. It was built using Google’s Tour Builder. You can view this VR tour on a desktop, tablet or phone. You can see 360 degrees when you move your cursor on the photos. With a smartphone and free software it should fill your field of vision, and the view changes as you turn your head. Google’s $15 smartphone holder (with free software for IOS and Android), can provide an immersive experience for the surround photos. This walk is easy and scenic. It’s about 2 miles and should take less than an hour. We’ll walk along the Columbia River from the Red Lion Hotel to the semi-secluded Hayden Island Bay. Then we see the South side of the island at Lotus Isle City Park and return back on Tomahawk Drive to the Red Lion. Let’s start our tour next to the I-5 bridge. An access road by the Red Lion Hotel (Oregon) curves around to the river. We’ll walk upriver about 1/2 mile to the Bay. The Red Lion is the largest of the three hotels on the island. The other two are Oxford Suites, across the street (200 rooms on 4 floors), and the Holiday Inn Express (74 rooms, 4 floors). The Holiday Inn is on the West side of the island, just past the shopping center. Features Restaurant, Boat landing, 36,000 sq ft of function space. Has river-facing deck by restaurant and lounge. The public access road curves around in front of the Red Lion Hotel. Now we are facing the Columbia River. At 1,200 miles, the Columbia is the largest river in the NW. The Interstate 5 bridge is River Mile 106.5 from the mouth of the Columbia and 45 miles downstream from Bonneville Dam. The 14 dams produce more power than those of any other North American river. Stern Wheeler dock. The excursion boats arrive Friday evening and leave on the weekends for a week-long cruise along the river. Two stern wheelerts from American Cruise Lines dock here; the American Pride and Queen of the West. A competing company runs a large stern wheeler on the Washington side, the American Empress. The tab on a week long Columbia River excursion is $3500-$5000. Next up, just beyond the Red Lion property, is a smallish marina on the Columbia that houses a variety of sailboats and yachts. You might see Harry Merlo’s 100 ft yacht, the Crystal Spirit here. Merlo left Louisiana-Pacific a wealthy man – but L-P’s exterior siding venture was a disaster. It rotted within a few years. We’ll follow the path along the river, proceeding in front of the Waterfront Condos. It will take us to Hayden Island Bay. The bay is lined with condominiums and apartments. As you leave the Red Lion Hotel property, you enter a walking path in front of the Waterside Condominiums property. It is currently encased in a giant wrap as they put all new siding on the units. Parking is on ground floor of this condo, with housing on the top two floors. A precaution against flooding. Columbia Point West Condominiums consist of 5 buildings (F,G,H,I &J) with 3 levels each. Well pass by Columbia Point West first, then past the adjoining Columbia Point East (at the entrance to the Bay). At the entrance to the Bay. Also a cluster of 5 buildings. With attached marina and pool. Townhouses located around the elbow of Hayden Bay. Located south of Hayden Bay, N of Tomahawk Dr. Located SE of Hayden Bay, N of Tomahawk Dr.
Portland’s largest amusement park, Lotus Isle, was located where the park now sits in the 1930s. It was built on Tomahawk (Sand) Island, the site of the old Columbia Beach Amusement Park. It gave the Jantzen Beach Amusement Park brief competition in the 1930s. Lotus Isle was also the birthplace of the Dance Marathon circuit in the Northwest. This southern half of the Columbia River is called North Portland Harbor. Across the harbor is the Oregon mainland and a charming community called Bridgeton. From the park, you can still see the pilings from the 700-foot trestle that once carried the streetcars that went on to Hayden Island and then to Vancouver, Washington (Google Map). Just to the west of the park are some of the floating homes that Jantzen Beach is noted for. There are some 500 floating homes on Jantzen Beach, (all on the south side of the island), operated by 4 different companies. Fire Station #17, built 1994, has 3 fireboats and 4 full-time firefighters stationed here. Fire Chief: Erin Janssens. On-duty personnel includes one company officer, one Harbor pilot, one engineer, and one firefighter paramedic. Apparatus comprised of Engine 17 (advanced life support), Rescue Boat 17, and Fire Boat 17. Two of those boats are often moored in the Jantzen Bay Marina, while the other is moored below the station. Norma’s Kitchen has authentic Cajun cuisine and interesting views of the harbor. The fire station is next door. The Oxford Suites, with some 88 units is on the right, next to the Wells Fargo bank and the Red Lion. 12226 N. Jantzen Beach Dr.
Well, that’s it! I hope you enjoyed our walk. Thanks for your company. 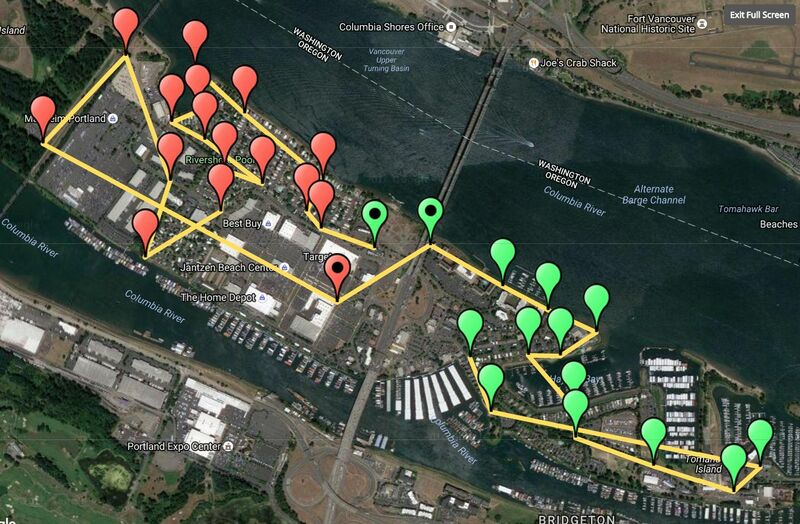 Here’s a complete bike tour of both East and West Hayden Island, using Google’s Tour Builder. In addition, here are two papers; Hayden Island Hazards report (pdf) and an Electrical Resiliency Report (pdf), both by Sam Churchill. They describe how power to the island might be restored after the electrical transmission towers fall into the river. Electricity would be restored in this plan using battery storage, Manheim’s existing solar panels, and Micro-grids at the island substation. For more adventure, try hiking the extreme East and West ends of Hayden Island. At the extreme Eastern end, after Tomahawk Drive stops, is a small beach, but access is not always available. At the extreme Western end, on the far side of the Railroad Bridge, is West Hayden Island. That property about 1 mile from here, is owned by the Port of Portland, but you can hike all the way down the beach to the end of Hayden Island. The 3 miles hike terminates opposite Port of Portland’s Terminal 6 and Kelly Point Park. You’ll see lots of homeless encampments on this neck of the woods but the beach and the river views are great.